Steal this bike. Or rather, take a bicycle that doesn't belong to you, use it for a while, then bring it back with no fees or fear of reprisals. That's the simple concept behind a new bicycle-borrowing program launched by a pair of Cambridge men who want to encourage their friends, colleagues, and clients to avoid driving to work. Mark Moreau, 28, an information-technology specialist at Cambridge Innovation Center in Kendall Square, said he got the idea while talking to co-worker Dane Jorgensen about longstanding arrangements in Amsterdam and Copenhagen and a new one in Paris. The City of Lights launched its bike-sharing program just last summer, aiming to cut down on vehicles and vehicle emissions, and attracting Moreau's attention. "We should do that here," he recalls thinking. The duo did a survey of the center's tenants and found nearly 75 percent of about 800 workers in the building used public transportation to get to work every day. 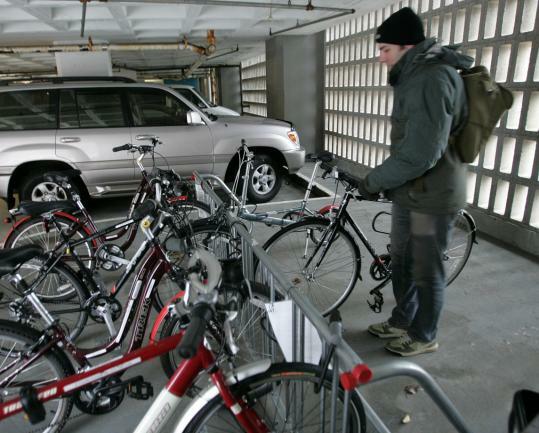 The idea of an informal bike-borrowing program got a warm reception among those they surveyed, said Jorgensen, 36, the center's facilities manager. After a few months of planning, the program kicked off in July with a couple of bikes, and has grown beyond expectations, said Moreau. "I thought it would just be me and a couple other guys who would use it," he said. "I didn't start this out with the idea of making a green statement," said Moreau, but more as a way to remind himself - and other adults who may have forgotten - that riding bikes is fun. "We're doing this as a service to our clients." Cambridge Innovation Center is an "incubator," offering short-term office space leases in One Broadway to small, high-tech startups, many with ties to MIT, that need a place to work but lack the capital to sign a regular, multiyear commercial lease, said Jorgensen. Anyone who works there or is a client of the 170 companies in the building is eligible to sign out a bicycle free of charge. Jorgensen said it was important to make sure the program, which is completely underwritten by the Innovation Center, was simple and easy, so there's no paperwork, no credit card deposit or driver's license or Social Security number required. "We didn't want to create a bureaucracy or take too much time for CIC workers to manage," he said. While most take the bikes only for a day or so, borrowers are permitted to take them for longer, said Moreau. Many use them during the work day to run errands or to zip over to the Cambridgeside Galleria for a quick lunch. Moreau keeps track of bike sign-outs and maintenance on a spreadsheet. All of the bikes in the fleet are named after horses from J.R.R. Tolkien's "The Lord of the Rings." The most popular style among borrowers is a mountain/road bike hybrid. Others in the fleet include dropped-frame bikes for women, a folding bike, and lightweight, single-speed road bikes popular with younger users. "I just kept expanding the fleet based on people's recommendations," said Moreau. Once it warms up for the long haul, the pair plans to expand the program by adding more bikes and even bring in energy-efficient motorized bikes that resemble mopeds but don't require a driver's license to operate. Though he tries to do the routine maintenance himself to keep costs down, Moreau, a former bike shop manager, takes all the bikes in for regular tune-ups of tires, gears, and chains every three months to Ace Wheelworks in Somerville. So far, none of the bikes have been damaged due to collisions, though the pair expects that'll happen sometime. And only one has been lost to theft - a borrower had a bike stolen from him. "It was not a big deal," Moreau said of losing the $800 bike. "I feel like people are trustworthy in general." "I was very skeptical about it, but it seems to work," said Jorgensen, who noted that a formerly free program in his native Denmark drastically cut down on vandalism once users were charged a nominal fee to borrow the bikes. The pair also realized early on that it was less expensive to replace missing bikes than to pay someone to try and prevent them from being stolen. "We appeal to people's better senses," said Jorgensen. "But if things change, we'll change the program." Moreau said he thought it would be great if other businesses in the area, or even the local municipalities, copied the idea and offered their own bike-borrowing programs. But if such offerings weren't financially self-sustaining, he added, the likelihood is still probably a long way off. Christina Pazzanese can be reached at pazzanese@globe.com.